GARY WOLFF, 15, son of Mr. and Mrs. Walter F. Wolff, a 9th grader at Pershing Junior High School, became an Eagle Scout in a ceremony at 7:30 pm Feb. 19 at Central Presbyterian Church. In scouting for 7 1/2 years, Gary attended the 1967 World Jamboree, has held many posts in Troop 43 and now is Senior Patrol Leader. 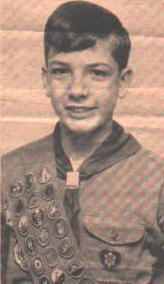 He won the Troop 43 Scout Teamwork Award for 1966, is a member of the Order of the Arrow, and is working on his Pro Deo et Patria (Lutheran God and Country Award). Gary passed the rigorous one-week Aquatic School at Camp Strake where he earned the Mile Swim and Scout Lifeguard awards, as well as the Swimming, Rowing, and Canoeing merit badges. Cycling, bird study, and astronomy top his interests among his 30 merit badges. In school, he's an honor roll student, member of the Student Council, National Junior Honor Society, and Robed Chorus. He is also on the Directory Staff, plays the cello in the school orchestra, and is on the varsity basketball team. Paul R. Caillet is his troop's Scoutmaster. 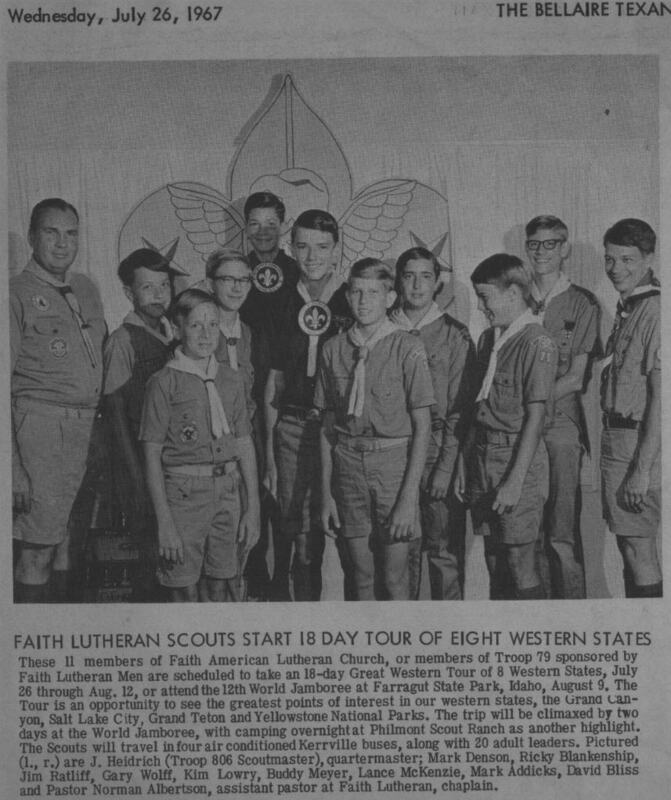 These 11 members of Faith American Lutheran Church (or members of Troop 79) sponsored by Faith Lutheran men are scheduled to take an 18-day Great Western Tour of eight western states, July 26 through August 12, or attend the 12th World Jamboree at Farragut State Park, Idaho, August 9. The tour is an opportunity to see the greatest points of interest in our western states: the Grand Canyon, Salt Lake City, and the Grand Teton and Yellowstone National Parks. The trip will be climaxed by two days at the World Jamboree, with camping overnight at Philmont Scout Ranch as another highlight. The scouts will travel in four air-conditioned Kerrville buses, along with 20 adult leaders. Pictured (left to right) are J. Heidrich (Troop 806 scoutmaster), quartermaster; Mark Denson, Ricky Blankenship, Jim Ratliff, Gary Wolff, Kim Lowry, Buddy Meyer, Lance McKenzie, Mark Addicks, David Bliss, and Pastor Norman Albertson, assistant pastor at Faith Lutheran, chaplain.